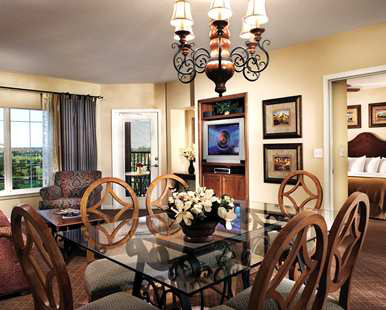 We will enjoy this luxurious 855 square foot one bedroom king suite filled with all the comfortable features of home. The kitchen, fully equipped down to utensils, includes a full-sized refrigerator, microwave, dishwasher and stove/oven. A dining area offers us an intimate setting for our self-prepared delicacies. The separate living area features a queen-sized sofa bed, relaxing chair, 32-inch TV and DVD player. When we are ready for bed, we will sink into the inviting king-sized bed in a separate bedroom with 27-inch TV. We will pamper ourselves in the well-appointed bathroom with the jetted tub perfect for soaking after a long day. This one-bedroom keeps us connected with complimentary WiFi and helps us stay on schedule using the Hilton alarm clock with MP3 connection. Views include fabulous swimming pools, water features and a bird’s eye view of the lush 34-acre resort grounds inspired by the beauty and ambiance of Tuscany. Our luxurious two-bedroom suite features two king-sized beds and all the comforts of being home. 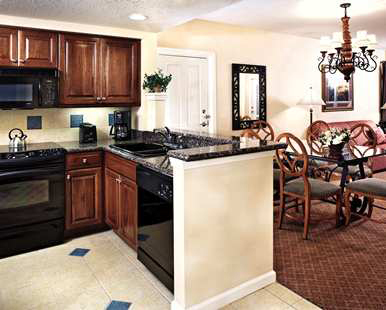 The kitchen-fully equipped down to utensils, includes a full-sized refrigerator, microwave, dishwasher and stove/oven. The suite includes a dining area and a separate living area with a queen-sized sofa bed, relaxing chair, 32-inch TV and DVD player. We will sink into the inviting king-sized bed in a separate bedroom with a 27-inch TV. We will pamper ourselves with a luxurious master bathroom with the jetted tub perfect for soaking in after a long day exploring. The second bathroom includes a shower/tub combo. This two bedroom keeps us connected with complimentary WiFi and helps us to stay on schedule using the Hilton alarm clock with MP3 connection. Views include fabulous swimming pools, water features and a bird’s eye view of the lush 34-acre resort grounds inspired by the beauty and ambiance of Tuscany. 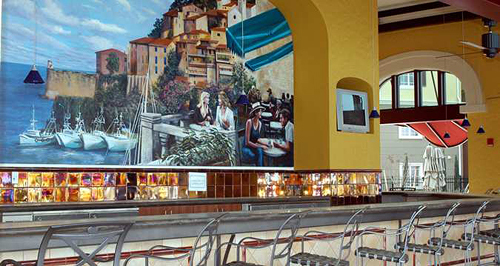 This delicatessen offers breakfast, lunch and dinner options with some items inspired by the rich flavors of Tuscany. The deli proudly serves Starbucks coffee and also offers a selection of grocery store items. 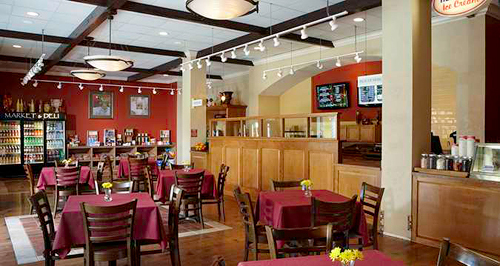 Fresh Tuscan Pizza offers classic pizza inspired by the rich flavors of Tuscany – a convenient way to refuel during our many Orlando adventures. Whether with delicious snacks or with classic cocktails, Laguna Snack Bar offers us the perfect poolside retreat to enjoy that famous Florida sunshine. 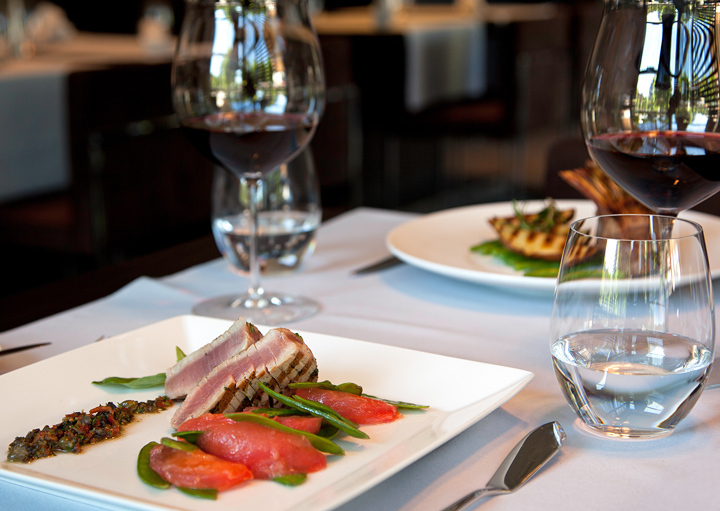 Toscana Pool Bar and Grill serves up freshly prepared entrees, appetizers, salads, sandwiches, and desserts, as well as our favorite specialty frozen and tropical drinks. Thanks to your wonderful wedding gift, we will relax into the ideal romantic honeymoon destination of Orlando! 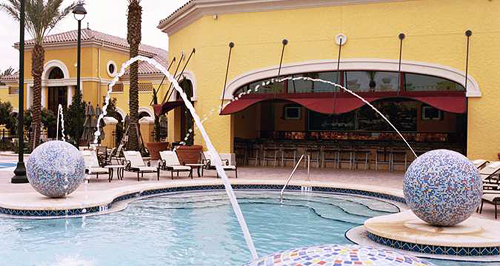 Inspired by the beauty and ambience of Tuscany, this distinguished resort in the heart of Orlando provides easy access to attractions and spacious studio and suite accommodations. 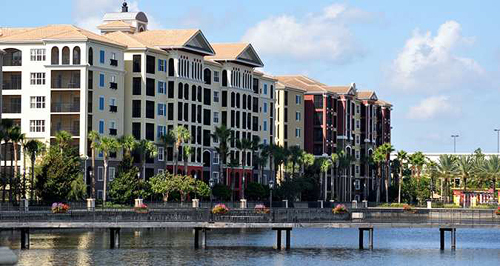 Here, a grand piazza opens to a lakefront walking path, dazzling swimming pools and water features. Within minutes of Walt Disney World Resort and adjacent to the Orlando Premium Outlets-Vineland Avenue, we’ll be treated to extraordinary amenities and an ideal setting for fun and relaxation. 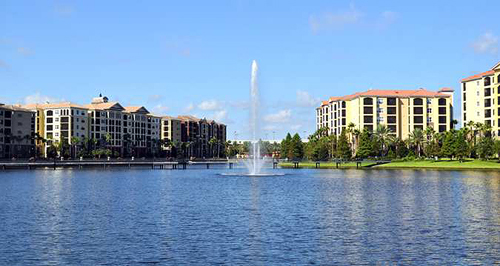 We will enjoy the region’s abundant venues for entertainment, golf, shopping and dining before retreating to the elegant Tuscany theme of this spectacular Orlando resort. Located in beautiful Orlando, Florida, Hilton Grand Vacations Club on International Drive promises us a romantic honeymoon getaway! With your thoughtful gift, we will enjoy countless activities, take comfort in luxurious studios and suites, savor classic cuisine in a resort setting or enjoy a round of drinks. The hotel’s location is perfect for exploring nearby attractions such as, Walt Disney World, SeaWorld Orlando, or the Orlando Premium Outlets – Vineland Avenue. A chilled bottle of champagne will be delivered to our room. 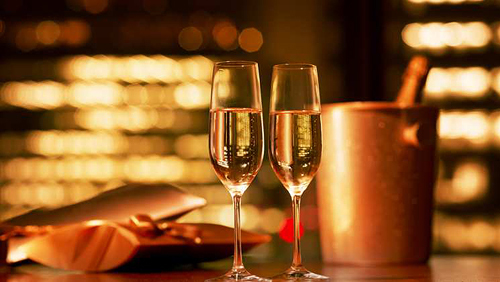 We will make a toast to our romantic honeymoon in Orlando while taking in the sweeping views of the lush resort grounds inspired by the beauty and ambiance of Tuscany. How romantic! A bottle of our favorite wine will be delivered to our room. 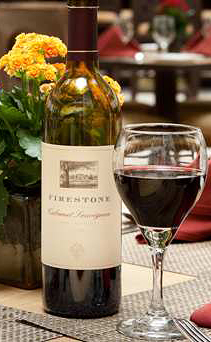 We will make a toast to our honeymoon while taking in the enchanted views of the resort, inspired by Tuscany. We will discover romance at its best!